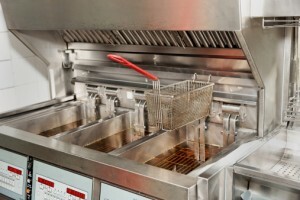 Flue Steam’s services can help protect against the #1 cause of commercial kitchen fires. Restaurants are full of potential fire hazards, including both items that could spark a fire and items that could fuel it. For example, a fire could be sparked by an open flame, a faulty electrical connection, or hot cooking equipment. That fire could then feed on any number of fuel sources such as cooking oils, grease buildup, cleaning chemicals, and paper products. The fact that one single hazard outstrips all others in causing the majority of restaurant fires is actually helpful to restaurant owners in a certain sense. It provides the ability to focus fire prevention efforts in one single area and see a big impact from those efforts. At Flue Steam, we offer a variety of essential services that can greatly reduce the risk of cooking equipment causing a fire in your commercial kitchen, and help reduce the amount of damage done by any fires that do manage to break out. Exhaust Hood Scraping: The exhaust hoods over your cooking equipment can get hot! In some cases, they may get so hot that any grease that has accumulated on them could be in danger of igniting into a flash fire. You can reduce the risk of this possibility by hiring Flue Steam to provide routine exhaust hood scraping services. Exhaust Duct Steam Cleaning: Vaporized grease can also make its way past your exhaust hood and accumulate on the walls of your ductwork, though at a much slower rate. If flames every reach this fuel source, fire could spread throughout the building very quickly. Flue Steam offers thorough steam cleaning services to help prevent such a scenario. Automatic Fire Suppression Systems: All commercial kitchens are required to have equipment in place that can automatically extinguish flames that break out on the cooktop or in the exhaust hood and prevent the fire from entering the ductwork. Flue Steam can install and service this equipment for you. Portable Fire Extinguishers: As a backup to your automatic fire suppression system, you should always have Class K portable fire extinguishers on hand for staff to use in putting out fires that may start anywhere in the kitchen. Flue Steam sells and services this type of fire prevention equipment too.